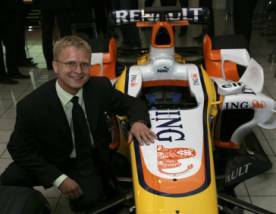 What does a 25-year-old engineering student studying aerodynamic optimization want more than anything in the world: a chance to work for six months with the ING Renault F1 Team in their Research and Development Department in Enstone, United Kingdom — with full accommodations and a company car, to boot! That is just what happened to Josef Dubsky from the Czech Republic when he entered the 2007 Altran Engineering Academy’s fourth annual worldwide competition — and defeated nearly 1,000 young engineers who entered detailed technical projects in the competition. Genuinely surprised, the 25 year-old was at a loss of words when Robin Tuluie, Head of R&D for ING Renault F1 Team, called his name at the end of a very tense day. Earlier, he had held his own when the jury deluged him with questions following his exposé on Automatic Aerodynamic Optimization Based on CFD. This brilliant presentation, coupled with his on-the-spot argumentation, allowed him to get ahead of the completion. no manual re-meshing, resulting in a dramatic reduction in time and costs per analysis. "The use of Sculptor was very instrumental in finding the ‘optimal solution’ and winning this very prestigious worldwide contest." Josef Dubsky, winner of Altran Engineering Academy Automatic Aerodynamic Optimization Contest. "This year the level of candidates was as high as ever, but unfortunately, there could only be one winner. I was really impressed by the preparation, the passion and research they put into their work, and I am sure they will all have a successful career. I hope all of them will fulfil their dream one day." Robin Tuluie, Head of R&D, Renault F1 Team. Mr. Dubsky is a colleague-student of TechSoft Engineering, a reseller for Optimal Solutions Software in the Czech/Slovak Republics. Since it was founded in 1991, TechSoft Engineering, located in Praha, Czech Republic, has specialized in technical analysis of a wide range of CFD/FEM industrial applications, as well as consultancy and support for its more than 200 customers. In support of these activities, the TechSoft R&D team is continually developing new computational methodologies and optimization processes for the CFD and FEM markets. On October 1, 2003, Optimal Solutions Software, LLC, officially launched “Sculptor”. Since that time, this major offering to the CFD/FEA industry has been answering the question of how to improve engineering designs—in the most cost-effective, timely manner. Sculptor is used to deform analysis meshes used in both CFD and FEA simulations. Using proprietary Arbitrary Shape Deformation (ASD) technology, the user can easily and intuitively change the shape of a model in a smooth and controlled manner. Major changes that previously took days can now be achieved in hours. The Company’s values-driven corporate strategy calls for utilizing Sculptor, whenever possible, to increase energy efficiency and reduce emissions of pollutants from automobiles, aircraft and industrial activities. The Big Three auto companies, as well as the top Formula 1 race car companies are using Sculptor to reduce drag on their cars, thus improving fuel consumption, while still allowing designers the freedom to incorporate their own aesthetics. Lockheed Martin, Boeing, and Cessna, as well, are working with Optimal Solutions to improve aerodynamic efficiencies of their aircraft. The Optimal Solutions Team knows that drag reduction saves billions of gallons of fuel per year, resulting in reduced dependence on crude oil—and a step closer to bolstering one of the Company’s major principals: “to pursue purpose beyond profit”. Josef Dubsky won the Altran Engineering Academy’s fourth annual worldwide competition.